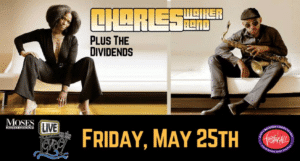 The Moses Auto Group Live on the Levee will kick-off in style as the City of Charleston welcomes The Charles Walker Band. With the incredible vocals of Porsche Carmon, who also plays bass and percussion, and Walker leading the charge on keyboards an saxophone, this band has shared the stage with Earth Wind & Fire, the Commodores, BB King, Cameo, Aaron Neville, and Richard Marx. The Schoenbaum Stage will come to life with live music that can be seen & heard from land or water. Food & Beverage vendors will also line the Kanawha Boulevard, featuring many local restaurants. Fireworks will follow the show beginning approximately 9:30 p.m. The Moses Auto Group Live on the Levee takes place every Friday from May 25- August 31, 218. AND THEY ARE ALL FREE! !